The Atra-hasis Epic is a literary form of Sumero-Babylonian traditions, dated around 1646–1626 B.C, about the creation of man and the Flood. It took about a century to gather and join the fragments that make up the three tablets of this epic. 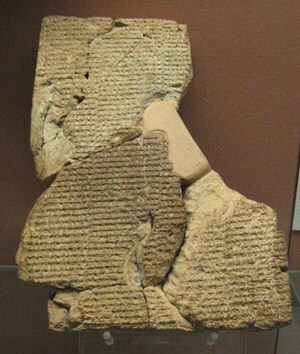 Despite having the much of the text, the epic is incomplete and has many gaps especially in the third tablet. This is a paraphrase from a translation found in James R. Battenfield, "Atra-hasis: A Survey," Grace Theological Journal (Spring, 1971), p. 3-22. The epic begins at a time when only gods inhabited the universe. Of the seven great Anunnaki (generic term for gods), three senior gods are the main character gods in the epic: Anu, Ellil and Enki. They cast lots to determine where each will rule: Anu, the senior most god, rules from heaven, Enlil rules from earth, and Enki rules from Apsu, a subterranean body of water. On earth, the Igigi (lesser gods) are assigned the task of digging canals. After 40 years of grumbling and complaining, they rebel and burn their tools. The Igigi approach and surround Enlil’s temple to demand freedom from their task. Instead of going to war, Enlil summons the Anunnaki, and a settlement is reached: Lullu-man will be created to do the chores the Igigi once had. Nintu, the birth-goddess, is called upon to create man, Lullu-man. She takes the remains of We-ila, a god of intelligence fetched from heaven by Anu and who is killed, and combines him with clay provided by Enki and the spit of the Igigi. Ten months later, seven pairs of male and female humans are born. In the ensuing years, mankind grows in population and creates a noise that ultimately disturbs Enlil’s sleep. Enlil decides to reduce the number of humans by sickness and summons Namtara the plague god. Atra-hasis, the king of humans, beseeches Enki to stop the plague. Revealed by Enki, Namtara received offerings from Atra-hasis and the plague was stopped. Loosing his sleep again, Enlil decides to use drought / famine to eradicate humans. Adad the storm god is summoned to withhold his rain. Atra-hasis seeks the help of Enki who reveals Adad as the cause of the drought. After a temple is built for Adad, the drought is rescinded. For the moment, Enlil is able to sleep again, but is later unable to for a third time; he suspects that the humans are being aided. The drought is resumed and Atra-hasis again prays to Enki for help. Enki intervenes and sends a whirlwind type of phenomena that transports water and fish to the starving humans. Enlil now knows that Enki has been thwarting his plans of destruction and decides that since water saved man, water shall be the means of his destruction. Confronted with his efforts of saving man, Enki promises to Enlil not to interfere any more. Enki however is not bound by his promise. Seeking Enki, Atra-hasis is warned that a flood will come in 7 days. To survive the flood, Atra-hasis must destroy his home and use its materials to build a strong roofed boat and provision it. Atra-hasis understands that the flood is the result of two gods who are very angry at each other and that he must leave earth and live with his god Enki. The flood arrives and lasts 7 days and 7 nights. Atra-hasis is able to save his family, birds, and animals. The destruction is complete and the Nintu the birth goddess mourns the loss. But Enlil sees Atra-hasis’ boat and is angry at the Igigi, who he mistakenly believes, assisted in Atra-hasis’ survival. Because the gods had decided and made an oath to rid earth of man, Enlil cannot understand how man survived. Anu points out that only Enki, whose realm is the sea, could save man. Enki steps forward and freely admits his deeds. 1. Battenfield, JR, "Atra-hasis: A Survey," Grace Theological Journal (Spring, 1971), p. 3-22.